Add the perfect finishing touch to your cottage-inspired decor with the Light Peach Floral Patchwork Quilt Set. The charming bedding is decked out in a light peach gingham and little pink floral print with scallop edging. 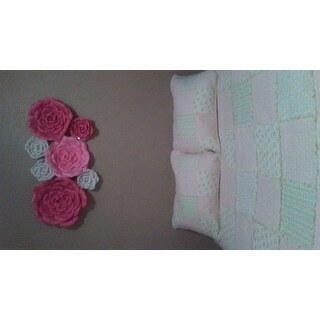 This is a beautiful quilt, although it is not peach but a light, soft pink. I didn't mind that at all. It is a nice quality quilt and I would definitely recommend it if you don't mind the variation in color. The color is actually a light pink. It will work ok for me. The quilt is made quite well and am hopeful it washes and dries ok. It is nice weight for all seasons here in IL. I would definitely recommend this to a friend! Beautiful colors soft, pastel and just as shown in the pictures. Quality of material is great. Very pleased with this spread and pillow sham. Would definitely recommend to others. It is very peach colored and not pink at all, but very pretty! It washed beautifully and it is very soft. My granddaughter snuggles right in. This is a very good quality quilt. I purchased 2 for the granddaughters and they love them also. The colors are quite pretty. They still look good after washing. This quilt is absolutely beautiful and so vintage looking. It is perfect for the antique iron bed I have it on. I am so glad I purchased it! The contractor that remodeled our home even remarked on how pretty it is. Great quilt. Good quality. Just as described.